Phillie Phanatic arrests late Marlins ace Jose Fernandez at Citizens Bank Park on May 18, 2016. As the Philadelphia Phillies wind down a season of encouraging improvement, the team's beloved mascot is still hustling. Multiple tweets Tuesday provided clues to an upcoming Sports Illustrated feature on the Phillie Phanatic, who has been synonymous with the team since journeying here from the Galapagos Islands in 1978. Wait, why is he wearing a dress? It looks like he'll featured in the magazine's famed Swimsuit Issue. Since the 2016 Swimsuit Issue is already out, it's safe to assume this photo shoot won't be seen by the public until 2017. While we look forward to that, we'll also look back at a touching moment the Phanatic shared with late Miami Marlins pitcher Jose Fernandez, who died early Sunday morning in a boating accident at the age of 24. In May, Fernandez ceremonially pranked the Phanatic by stealing the keys to his quad. 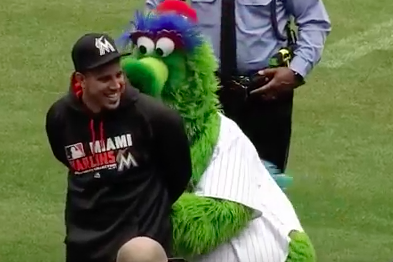 With assistance from a Philadelphia police officer in attendance, the Phanatic obtained handcuffs and placed Fernandez under arrest. Over the weekend, several Phillies shared their shock and grief over the loss of Fernandez, an energetic All-Star whose ceiling many felt could only be limited by his absence from the mound. A public memorial and viewing for Fernandez will be held Wednesday afternoon at the West Plaza at Marlins Park.